It’s been a rough week for coaches in the world of professional sports. In the NBA, one was fined $50,000 for spilling a drink on the court to get a free timeout. In the NFL, the league is investigating a coach for stepping onto the field and interfering with a play. By contrast, the NHL hasn’t had to fine any coaches in months [everyone warily eyes Patrick Roy]. Then again, it’s not as if the league can exactly gloat about how well mannered its coaches are. In fact, the league has a long history of meltdowns, tantrums, assaults, and flat-out cheating behind the bench. Here are 10 such notable incidents from NHL history. So Mike Tomlin might get fined for briefly stepping onto the field? Big deal. In the NHL, coaches charge onto the ice to try to pummel the official timekeeper. Well, OK, not all coaches. 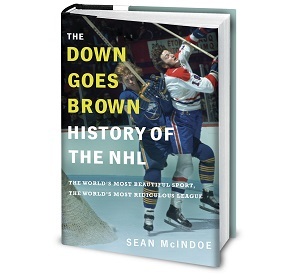 Actually, only one: Mike Keenan, who attempted the feat back in 1990. Keenan was upset over a disallowed goal, or perhaps simply mesmerized by that red-sweatered fan with the mullet and parachute pants. In either case, I think we can all agree that when Stu Grimson and Eddie Belfour are trying to calm you down, you may have taken things too far. Littering the playing surface to get a free timeout? Nice idea, Jason Kidd. But as @geoffdes78 reminded me, Jacques Demers beat you to it by roughly 27 years. Back in the first round of the 1986 playoffs, Demers and his St. Louis Blues were facing Minnesota in a hard-fought series. Three games in, North Stars general manager Lou Nanne leveled a stunning accusation: In each game, Demers had thrown coins onto the ice in an attempt to create a delay and rest his players. Demers, being a man of unflinching integrity, quickly set the record straight: He’d only done it in one of the games, not three. “I just happened to be an honest person who didn’t deny it,” he told reporters. Demers didn’t end up having to spend any of his nickels on a fine; the league let him off with a warning. Weekend wrap: Do the Bruins own the East?